In what was the first ever event of its kind, Joseph Di Rosa Rojas came out on top of Event #23: $2,620 "Marathon" No-Limit Hold'Em. 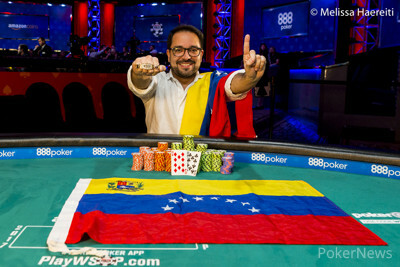 Rojas defeated Alexander Lynskey in a heads-up battle to take home the first place prize of $690,469 and the first WSOP gold bracelet for his home country of Venezuela. Rojas came into the day as the chip leader and never relinquished that lead as he went into heads-up play with an eight-to-one chip lead. In the final hand of the night, Rojas limped the button and baited Lynskey into an all-in shove, which Rojas quickly called. Rojas was way ahead with the vs Lynskey's , however, when the flop came he would need some help. That help came in the form of the on the turn. The completed the board and Rojas came out victorious, as his rail jumped over the gates and flooded the stage area with cheers. Rojas, a Venezuelan pro, realized he had a real shot at winning a bracelet today once the final two tables came together. He explained that he intended to play a lot of hands with the huge lead he had and stuck to this plan. This is Venezuela's first WSOP gold bracelet, and when asked how he feels about this he said, "I don't know, maybe tomorrow I will know," he laughed, clearly overcome with emotion. The newly-crowned champion began playing poker eight years ago, and it's his second time playing in Las Vegas. He has played in Barcelona, Bahamas, Panama, and Aruba. This is his first official win, and before today's win, his total earnings added up to $55,344. Rojas explained that he is very focused on poker, and he will keep playing online and working on his game. "I like tournaments more than cash games. It's more of a competition," he said. He plans on enjoying this win and staying until the end of the series, including a shot at the Main Event in July. The final table took a total of 210 hands to play and here is a summary of the action. The official final table of nine players came together after Josh Weiss (10th place - $42,334) and his super short stack were ousted by Julian Stuer. Maurice Hawkins (9th place - $54,356) came into the final table as a short stack as well, having just over three big blinds. He got his remaining chips in the middle with two live cards and a gut-shot straight draw but was unable to hit anything. Not far behind him was Pratik Ghatge (8th place - $70,590), when he was all-in vs Andrew Jernigan. Ghatge was in a dominating position preflop but Jernigan out-flopped him sending Ghatge to the cash cage. After taking out the seventh place finisher, Andrew Jernigan (7th place - $92,705) still found himself as a short stack and couldn't get anything going. He was all-in with against Stuer's and was unable to hit a nine. Faraz Jaka (6th place - $123,105) was pretty quiet all day but managed to ladder up to a sixth place finish. He, too, had all of his chips in the middle in a dominated position against Alexander Lynskey and could not catch up afterward. It was an action-packed hour after the dinner break, as there were five all-ins within ten hands, in which case nobody busted. On the sixth all-in, it was Julian Stuer (5th place - $165,277) at risk with against Tomlinson's . Stuer flopped a set but it wasn't good enough to beat Tomlinson's flush on the river. Four-handed play didn't last very long either as it was Tim Reilly (4th place - $224,316) who found himself all-in with pocket eights vs Tomlinson's pocket nines. Reilly couldn't catch an eight and was sent to the rail. The 53-year-old Jeffrey Tomlinson (3rd place - $307,728) put up an outstanding fight on the final table put just came up short when his ace-king was beaten by Rojas' pocket eights. Tomlinson was a former WSOP bracelet winner in the 2015 $5,000 8-max event. That set the stage for a heads-up match between Lynskey and Rojas, with the Venezuelan holding a massive chip lead. This unique style of tournament featured 100-minute levels and put players to the test on the ultimate grind level with days taking up to 14-hours to complete. It attracted a total of 1,759 entries that generated a prizepool of $4,147,722. There were 264 places that got paid, with each of them being guaranteed to cash for $3,934. Some notables that took home some money but failed to reach the final table include Patrick Mahoney (13th place - $33,350), Upeshka De Silva (30th place - $17,491), Kristen Bicknell (44th place - $14,446), Adrian Mateos (52nd place - $12,077), and Jason Mercier (143rd place - $4,909). 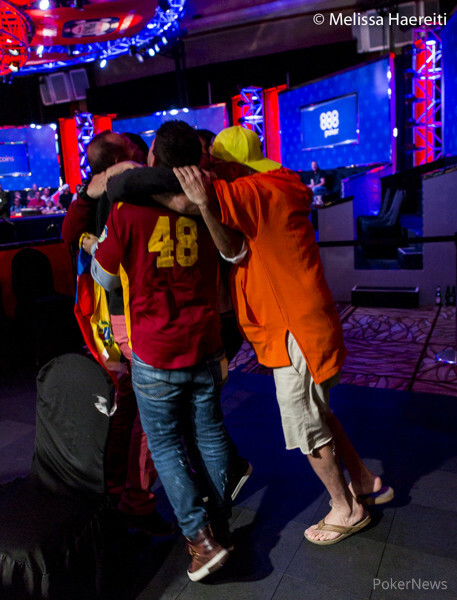 That wraps things up for this event but PokerNews will continue to provide extensive coverage throughout the summer. Hand #210: Joseph Di Rosa Rojas limped in on the button, and Alexander Lynskey moved all in for about 3,400,000. Rojas snap-called. Lynskey was at risk with and Rojas tabled . The flop came and Lynskey pulled ahead with two pair, nines and sixes. The turn was the and Rojas' rail went wild as the board paired, giving Rojas a better two pair. The river was the and Lynskey was eliminated in second place. Hand #207: Alexander Lynskey raised to 600,000 and Joseph Di Rosa Rojas called. The flop was and both players checked to the and the river . Rojas tabled to win the hand. Hand #208: Rojas limped the button and Lynskey moved all-in getting a fold from Rojas. Hand #209: Lynskey raised to 600,000 and Rojas called. The flop was and Rojas check-called a bet of 500,000. The turn was the and both players checked. The river was the and Rojas won the pot with a bet of 800,000. Hand #202: Joseph Di Rosa Rojas raised to 600,000 on the button and Alexander Lynskey called. The flop came and Lynskey check-called a bet of 600,000 from Rojas. The turn was the and both players checked to the on the river. Lynskey bet 1,250,000 and Rojas called. Lynskey tabled and Rojas tabled , good for a chop. Hand #203: Lynskey limped in and Rojas checked. The flop came . Rojas checked, Lynskey bet 250,000 and Rojas raised to 800,000. Lynskey four-bet to 1,450,000. Lynskey had about 3,500,000 behind and Rojas five-bet shoved. Lynskey folded. Hand #204: Rojas limped and Lynskey checked. The flop came and Lynskey check-called a bet of 250,000 from Rojas. The turn was the and the players checked to the on the river. Both players checked again and Lynskey tabled for a straight. Hand #205: Rojas got a walk. Hand #206: Rojas raised to 500,000 on the button, Lynskey moved all in for 3,470,000 and Rojas tank-folded. Hand #197: Alexander Lynskey raised to 600,000 and Joseph Di Rosa Rojas called. The flop came and Lynskey bet 450,000 which was called by Rojas. The turn was the and Rojas checked-called a bet of 1,450,000 again. The river brought the and Rojas led out for 2,700,000. Lynskey folded and Rojas showed for a missed flush draw. Hand #198: Rojas raised to 600,000 and Lynskey moved all-in, which resulted in Rojas folding. Hand #199: Lynskey raised to 600,000 and Rojas called to see the flop of . Rojas check-called a bet of 375,000 and the came on the turn. Rojas checked again to Lynskey who bet 975,000. Rojas called and the fell on the river. Both players checked and Rojas showed for the nut flush. Hand #200: Rojas raised to 600,000 and Lynskey folded. Hand #201: Lynskey raised all-in for 4,500,000 and Rojas folded. Hand #192: Joseph Di Rosa Rojas raised to 500,000 on the button and Alexander Lynskey called. The flop came and both players checked to the on the turn and the on the river. Lynskey checked, Rojas bet 600,000 and Lynskey called. Rojas didn't want to show, so Lynskey tabled and a pair of nines was good. Hand #193: Lynskey raised to 600,000 and got no action. Hand #194: Rojas raised to 600,000 on the button and Lynskey called. The flop came and they both checked to the turn, which was the . Lynskey checked, Rojas bet 600,000 and Lynskey folded. Hand #195: Lynskey raised to 600,000 on the button and Rojas called. The flop came and both players checked. The turn was the and Rojas bet 600,000. Lynskey called. The river was the and Rojas bet 1,200,000. Lynskey called and Rojas tabled for two pair. Lynskey mucked. Hand #196: Rojas raised to 600,000 on the button and Lynskey called. The flop came and both players checked to the on the turn and the on the river. Lynskey bet 800,000 and Rojas called. Lynskey tabled and Rojas mucked. Hand #191: Jeffrey Tomlinson raised all-in for 2,600,000 on the button and Joseph Di Rosa Rojas called from the big blind. Tomlinson held and was in a race situation vs Rojas' . The board ran out and Tomlinson was unable to hit the board. 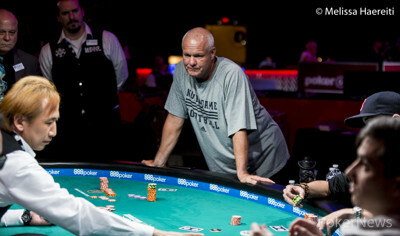 Tomlinson was eliminated in 3rd place but will take home over $300,000 for his strong efforts today. Hand #185: Joseph Di Rosa Rojas gets a walk. Hand #186: Rojas raised to 500,000 from the small blind and Jeffrey Tomlinson defended his big blind. The flop came . Rojas checked, Tomlinson bet 1,000,000 and Rojas moved all in. Tomlinson had 2,400,000 behind and opted to fold. Hand #187: Tomlinson shoved from the small blind and Alexander Lynskey mucked. Hand #188: Lynskey limped from the small blind, Rojas raised to 740,000 and Lynskey mucked. Hand #189: Rojas limped from the small blind, Tomlinson moved all in from the big blind and Rojas mucked. Hand #190: Rojas raised to 500,000 and Lynskey called from the big blind. The flop was and Lynskey checked to Rojas who bet 500,000. Lynskey raised to 1,150,000 and Rojas folded. Hand #180: Alexander Lynskey raised to 500,000 and Jeffrey Tomlinson re-raised to 1,500,000. Lynskey called and the flop came . Tomlinson bet 1,900,000 and Lynskey moved all-in, sparking a quick fold from his opponent. Hand #181: Tomlinson limped the small blind and Lynskey pushed all-in, getting Tomlinson to fold again. Hand #182: Lynskey limped the small blind and Joseph Di Rosa Rojas checked his option. The flop was and Lynskey bet 240,000 which Rojas called. The turn was the and both players checked to the river. Lynskey checked again and Rojas bet 375,000. Lynskey called with and had the best hand. Hand #183: Lynskey raised to 500,000 on the button and Tomlinson called from the big blind. The flop came and Lynskey won the pot with a bet of 260,000. Hand #184: Rojas raised to 500,000 and Lynskey called from the big blind. 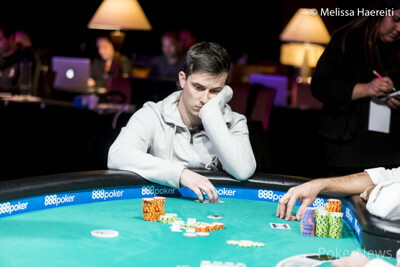 The flop was and Lynskey check-called a bet of 550,000 from Rojas. The turn was the and both players checked. The river brought the and Lynskey led out for 1,175,000. Rojas thought for a couple moments and then raised to 3,675,000 sending Lynskey into the tank. Lynskey finally called and Rojas tabled for a full house. He then turned and shouted with his rail as they started cheering in Spanish. Unofficial Final Table of Ten in the "Marathon"